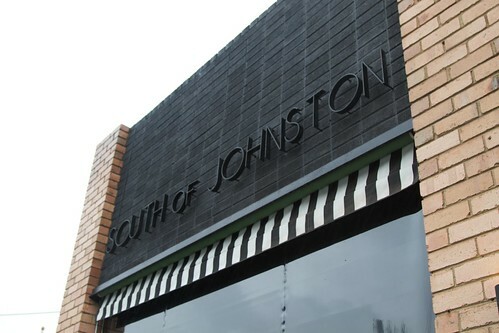 What better way to celebrate the Queen’s birthday weekend than a trip to South of Johnston, abbreviated as SOJO. The weather outside, however, was not in such a festive spirit, and all of Collingwood was covered in a destitute gray rain; a very Melbourne winter day. Our brunch companions were running a little (ok, very) late, and all I wanted to do was curl up in a couch next to a fire. Luckily when we finally decided to go inside that’s exactly what SOJO had on offer. 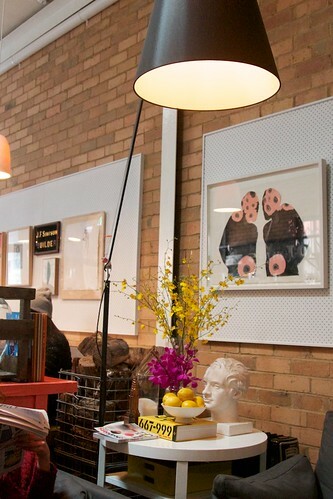 The inside of SOJO resembles a quirky loft, except with a lot more tables; there are piles of books, prints, oversized lamps and even a terrarium. Everything the SOJO hipster would need. We were hospitably offered a seat next to the fireplace while we waited for an available table, and after a cheeky long black we were offered a table inside. There was a noticeable contrast between the guy running front of house, who was very warm and friendly, and the other wait staff, who were a little cold and lax with the service. It took a some of the shine off an otherwise great dining experience. My eyes are unfortunately bigger than my stomach, and I just couldn’t go past the pancakes with bacon and maple syrup, a combination which is truly underappreciated in Australia. Last time Marg and I were in the US, we ended up going to Denny’s (I know, the shame), and at the time, they had an entire menu dedicated to Bacon. It was excellently dubbed Baconalia – a celebration of bacon. I think that there should be more celebration of bacon in Australia and I’m glad that SOJO is now leading the charge. You can never have too much bacon and maple syrup. 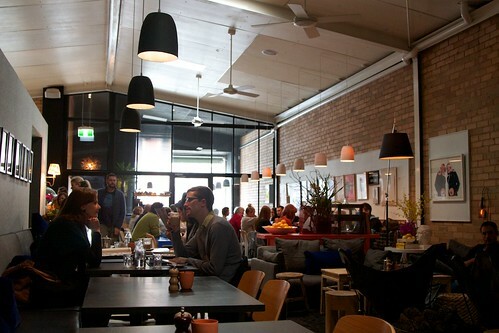 I’ve written previously about how much I love brunch at Mart 130, so you can probably imagine how excited I was when I heard about the new cafe South of Johnston in Collingwood opened by one of Mart’s former owners. South of Johnston, or SOJO, is gorgeous. Really gorgeous. When we walked in I was blown away by the fit out, it’s the nicest cafe I’ve seen in a while. 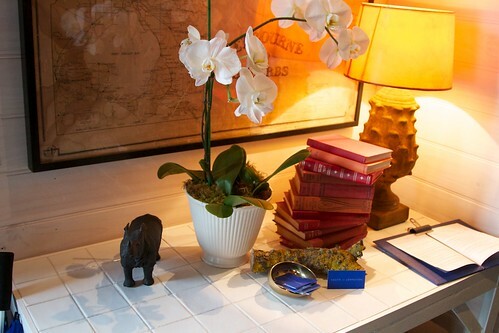 Like Mart, SOJO has an amazingly homely and cozy atmosphere. It’s the sort of place that makes you want to camp out at a table all day. There’s a nice little indoor/outdoor deck at the front of the cafe and then a cavernous warehouse conversion style room complete with share tables, lots of padded bench seats and a lounge area with couches and a fireplace. And a giant terrarium. 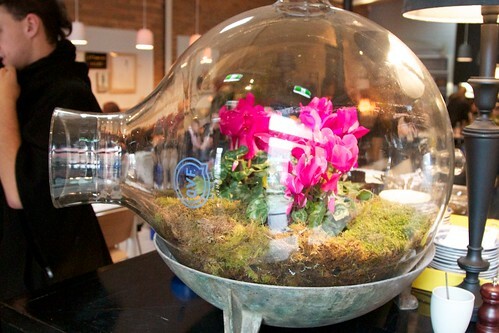 I love a good terrarium. Did I mention that there are couches and a fireplace? They were the best Jerry, the best. While I loved the fit out, I also really liked the menu. The winter menu features a big selection of brunch and lunch options including Mart classics like corn fritters. In fact there were so many options that I was almost a little overwhelmed. Surprisingly though there were no sides or optional extras on the menu, I don’t know how I feel about that. 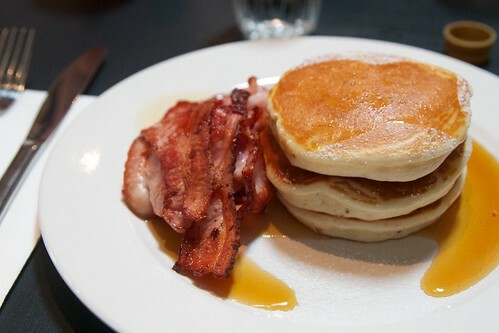 Gerard had the pancakes with grilled bacon and maple syrup ($15.90). Gerard really liked the pancakes but was a little upset that he couldn’t have them with berries, ice cream, bacon AND maple syrup, unfortunately you have to choose between the berries & ice cream and bacon & maple syrup. I also really liked that they give you a bottle of maple syrup, I’ve probably said it before but I get disproportionately annoyed by cafes who try to control your syrup portions. 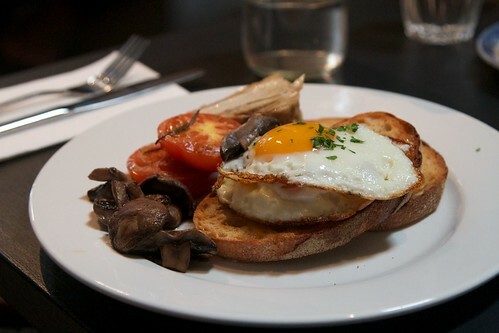 I had the fried eggs with kaiserfleisch, roasted mushrooms, roast tomato and rosemary on sourdough ($16.90). I’ll be honest, I ordered the eggs fully expecting the kaiserfleisch to come in the form of bacon so my pleasant surprise of the day was when my eggs came with a nice little slab of pork belly (seen hiding at the back of the plate in the photo below). Mmmm. 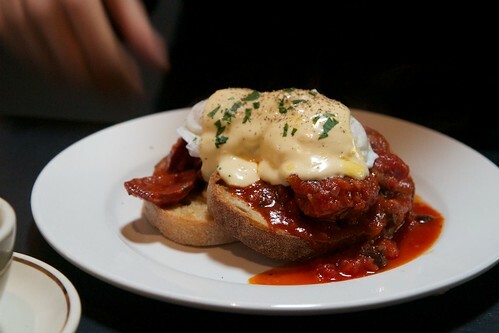 Gerard’s BFF had the chorizo eggs which are a lot like Mart’s eggs #4 – poached eggs with chorizo, olive and napoli ragu with hollandaise sauce on sourdough toast ($16.90). 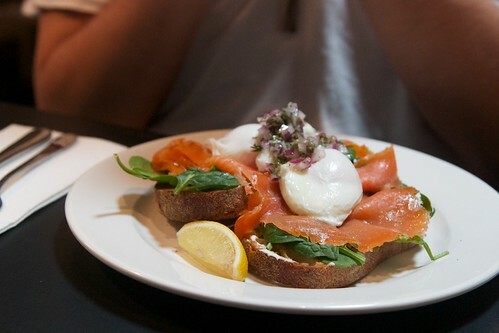 Gerard’s other school friend who was wearing a cloak to breakfast (that’s not relevant, I just need to put it in writing) had the salmon eggs – poached eggs with smoked salmon, spinach and creme fraiche with a caper, dill and red onion salsa on sourdough toast ($16.90). They looked great. SOJO is a great place to spend a rainy morning or afternoon, or both. Get in early, get a spot by the fire and don’t leave. This entry was posted in Eating out and tagged brunch. Bookmark the permalink. Trackbacks are closed, but you can post a comment.